They provide holistic support to local organisations who wish to improve the quality and quantity of their mobility products and services, set up initiatives to build capacity, assist people with disabilities into mainstream employment and to advocate for their rights. To date they have worked in 33 countries. WCRC and Motivation are underway with a three year service level agreement to collaborate on wheelchair issues related to training, services and product vision. All planned activities are in line with the recently developed World Health Organisation “Guidelines for Wheelchair Provision in Less Resourced Settings” , which have been developed with the involvement of WCRC, Motivation and various other International organizations and which form one of the " tangibles" that has come from the 3-year SLA signed between the DoH (WCRC) and Motivation. Elsje Scheffler, Physiotherapist at WCRC was one of the peer reviewers for these Guidelines. The WCRC is listed as one of the six Training Resources in the world! Elsje, as well as Mansur Cloete, both Supervisory Physiotherapists, regularly acts as external examiners for the wheelchair technologist course at the Tanzanian Training Centre for Orthopaedic Technologists (TATCOT) in Moshi, Tanzania. The Motivation team are based at WCRC in Ward D, from where they are co-ordinating the South African programme and also their Regional Africa programme, spanning 14 countries. The current team members are: Christine Cornick (Regional Director), Nicky Seymour (OT and Clinical Co-ordinator) and Ronald Mkunya (Administrator). Together with WCRC they have developed professional wheelchair services of an excellent standard which can be used as the basis for models in other countries. 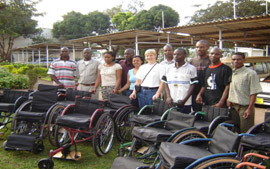 Here is Elsje with the group of wheelchair technologist students and some of the wheelchairs they have hand-built as part of their training. TATCOT offers the only internationally accredited wheelchair technologist course in the world. Peer Supporter training: Collaboration between HWSETA, APD Western Cape, Nascence Education and WCRC June 2010 till February 2011. View the Power Point presentation regarding the outcomes of this programme .